Plot: A group of kids set out on a treasure hunt to raise enough money to save their neighbourhood but are being pursued by ruthless criminals. Goonies never say die, but that doesn’t mean they don’t live very very long in the memory. Made at the height of Amblin Entertainment’s powers, after the likes of E.T. and Gremlins had set the benchmark, The Goonies is the ultimate kid’s own adventure. Like the best of Pixar Amblin had that innate ability to appeal to kids and stay with them for the rest of their lives. There is a moment in the theatrical cut of The Goonies, which this edition thankfully is, in which a reporter asks the gang of kids what was the scariest moment. Data, played by Jonathan Ke Quan – who had previously played Short Round in Indiana Jones And The Temple Of Doom – states that “The octopus was very scary!”. We never see the octopus but the line works as both something comedic and poignant. Because it demonstrates that these kids where literally living out a fantasy. That’s not to say the story is in anyway a Tyler Duden from Fight Club scenario, there’s no doubt it all takes place, but instead this is very much what every kid at some point dreams about; finding a treasure map and going on a quest to find said treasure, no matter the dangers involved. The deleted scenes demonstrate that in the director’s cut there was in fact an octopus but the sentiment remains clear with its deletion. Mikey (Sean Astin) is worried about the fact his family and friend’s neighbourhood is about to be demolished to make way for a country club unless they can find the money to save their homes. So, having found a treasure map in his dad’s attic, he assembles his gang of Goonies that include Chunk (Jeff Cohen), Mouth (Cory Feldman) and Data (Quan), to help him find the loot. But when brother Brand (Josh Brolin) and his tag-along would-be date Andy (Kerri Green), and her friend Stef (Martha Plimpton) arrive it seems the game is up. But with recently escaped criminals The Fratellis now also in pursuit of the kids and the treasure they have no choice but to delve into the depths of their town’s cave system to find the infamous One Eyed Willy’s ship. The Goonies is an iconic film, one that should be shown to children of every generation and at now thirty years old it hasn’t dated one iota. The script is peppered with brilliant dialogue, it’s endlessly inventive and, what would later become his trademark with Home Alone, a level of Chris Columbus slap-stick in his villains to make them threatening but never scary, you know, for the kids. Richard Donner handles everything, including his young cast, with the grace of a master. It would have been easy to go gimmicky but instead Donner allows some stunning sets and a riveting score from Dave Grusin to bring much of the excitement to proceedings. 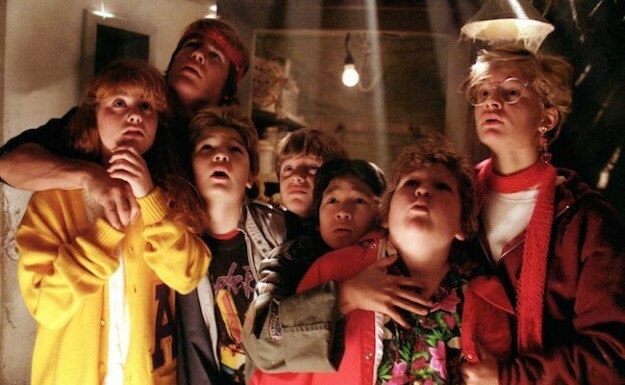 But the real genius of Goonies lies in its simplicity, its ability to tap into what it means to be a kid who has no control over the big decisions that impact their lives. Sure there’s swashbuckling and booby-traps and pirate ships but watching it again as an adult you’re swept up in the adventure thanks to the realisation that when you first saw it you felt the same way. This edition of the film comes complete with a host of excellent and seemingly endless extras. Many are recycled from previous incarnations of the film’s home entertainment releases but they’re all worth a visit with the cast commentary being a particular highlight. It seems the camaraderie on screen remains strong in the grown-up cast even now. Since last year rumours have circulated that Donner, Columbus and producer Steven Spielberg were all planning on making The Goonies 2. The reality is that capturing this kind of magic on screen is a rare feat indeed and for that reason The Goonies 30th Anniversary Edition is the best and only Goonies we need for the foreseeable future. Goonies never say die, but that doesn’t mean they don’t live very very long in the memory.